Stephen Downes is a specialist in online learning technology and new media. Through a 25 year career in the field Downes has developed and deployed a series of progressively more innovative technologies, beginning with multi-user domains (MUDs) in the 1990s, open online communities in the 2000s, and personal learning environments in the 2010s. Downes is perhaps best known for his daily newsletter, OLDaily, which is distributed by web, email and RSS to thousands of subscribers around the world, and as the originator of the Massive Open Online Course (MOOC), is a leading voice in online and networked learning, and has authored learning management and content syndication software. Downes is known as a leading proponent of connectivism, a theory describing how people know and learn using network processes. Hence he has also published in the areas of logic and reasoning, 21st century skills, and critical literacies. 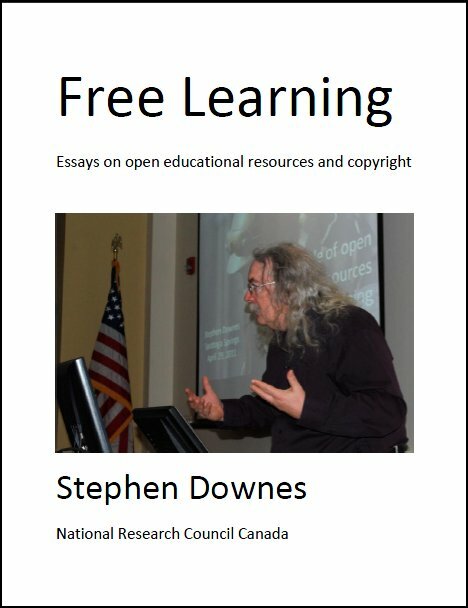 Downes is also recognized as a leading voice in the open education movement, having developed early work in learning objects to a world-leading advocacy of open educational resources and free learning. Downes is widely recognized for his deep, passionate and articulate exposition of a range of insights melding theories of education and philosophy, new media and computer technology. He has published hundreds of articles online and in print and has presented around the world to academic conferences in dozens of countries on five continents. At the University of Alberta between 1999-2001 he built a learning and research portal for the municipal sector in that province, Munimall, and another for the Engineering and Geology sector, PEGGAsus. He also pioneered the development of learning objects and was one of the first adopters and developers of RSS content syndication in education. Downes introduced the concept of e-learning 2.0 and with George Siemens developed and defined the concept of Connectivism, using the social network approach to deliver open online courses to three thousand participants over two years. He developed some of Canada's first online courses at Assiniboine Community College in Brandon, Manitoba between 1995-1999. He also built a learning management system from scratch and authored the now-classic "The Future of Online Learning". Downes has been offering courses in learning, logic, philosophy both online and off since 1987, has 135 articles published in books, magazines and academic journals, and has presented his unique perspective on learning and technology more than 250 times to audiences in 17 countries on five continents. He is a habitual photographer, plays darts for money, and can be found at home with his wife Andrea and four cats in Moncton, New Brunswick, Canada. With Canada's National Research Council since 2001, Stephen Downes is a specialist in online learning technology and new media. He leads the Learning and Performance Support Systems research program. Through a 25 year career in the field Downes has developed and deployed a series of progressively more innovative technologies, ranging from Canada's first academic MUD in the 1990s, to one of its first web-based courses, through the development of a learning management system, an online research Stephen Downes works for the National Research Council of Canada where he has served as a Senior Researcher, based in Moncton, New Brunswick, since 2001. Affiliated with the Learning and Collaborative Technologies Group, Institute for Information Technology, Downes specializes in the fields of online learning, new media, pedagogy and philosophy. Downes was born in Montreal, Quebec, in 1959 and has four brothers (all younger). He lives in Casselman, Ontario, with his wife Andrea (b. Colorado Springs, Colorado; married 1998) and four cats (Bart, Polly, Lexi and Alex). Stephen reads a lot of science fiction and books in general. He enjoys movies, television and sports, especially hockey. He enjoys playing darts and NTN Trivia (though since Moncton has no NTN locations, it's a lot harder to play. He is an avid Civilization III player and an enthusiastic photographer. His cat, was the first feline in Manitoba to have had her own web page. A full biography, in fifteen or twenty easy paragraphs. Charaterized by the fact that they were refereed or otherwise reviewed and formally accepted. Links to online versions.